Donna Andersen determined through surveys and her knowledge of people that the term “sociopath” should be revived and used to describe those who (irrespective of their official psychiatric diagnosis) have adopted a predatory or parasitic lifestyle. 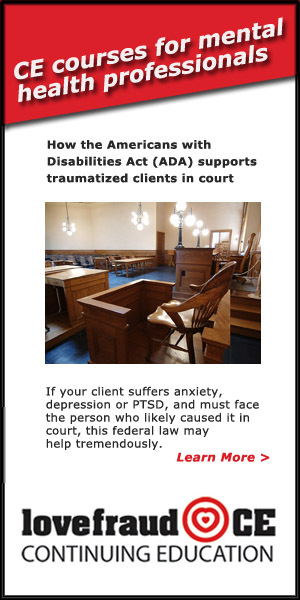 In taking this bold step, Donna has filled the void created by my colleagues in Academics and the American Psychiatric Association who can’t seem to agree on how to name and define this group. These are people who are called by many names in popular psychology books including: psychopath, narcissist, antisocial, and borderline. The word sociopath tells us what many with these diagnoses are socially sick. The person on the street need not care about diagnoses, the person on the street needs to know how to spot and avoid the socially sick. 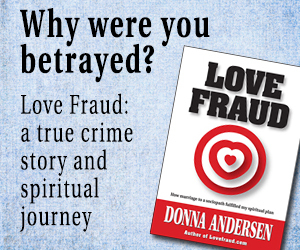 Red Flags of Love Fraud is the best book yet about how to do just that. It shows us how to identify and avoid predators and parasites. The word “sociopath” also does a service to the mentally ill; to use it is to understand that not all people who suffer with psychiatric disorders are dangerous. A sociopath is by definition dangerous because that individual has a mental illness AND has made a choice to victimize others. 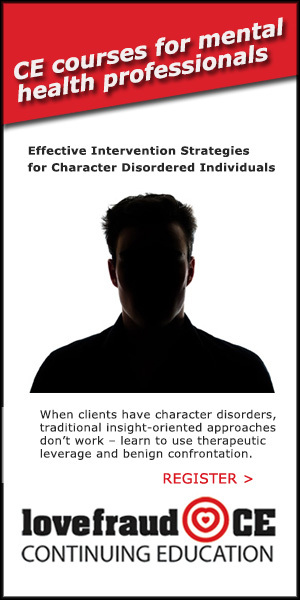 Though initially a choice, victimizing behavior becomes an addiction the disordered person will not overcome. I know Donna to be a first class journalist who bases her writing on solid research. 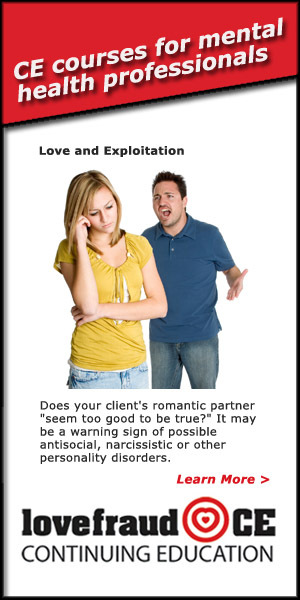 Red Flags of Love Fraud is no exception. The information in the book is based on scientific surveys and her experience with thousands of victims. 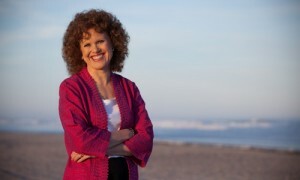 In addition to being an outstanding writer, Donna has dedicated her life to preventing suffering by giving people the tools they need to protect themselves. 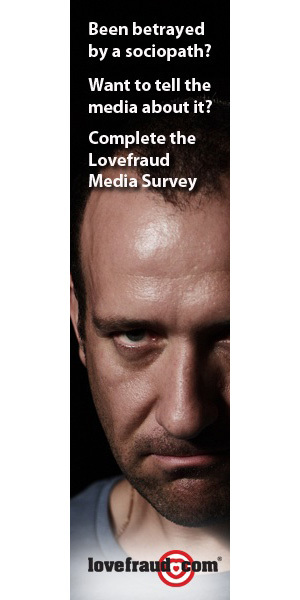 Red Flags of Love Fraud is well written, organized and understandable. 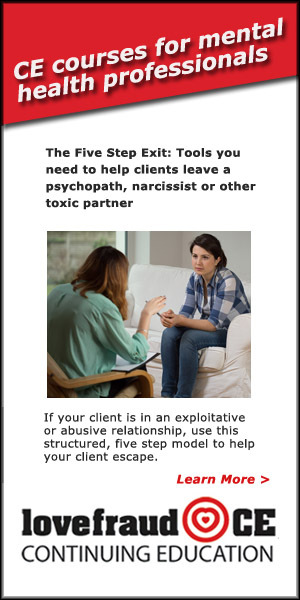 Together, the book and accompanying workbook provide a complete look at how to avoid entanglement with a sociopath. This set of books makes a great graduation or birthday gift for a young person. Buy them as a present for yourself if you are single and dating. 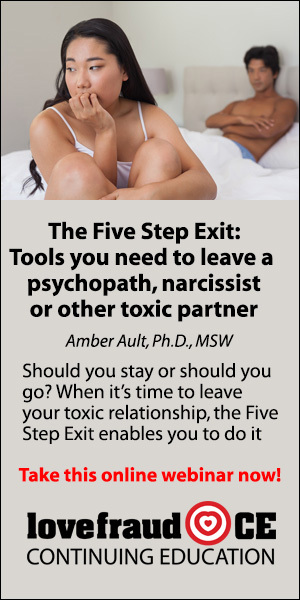 You need to know this information to avoid a situation where the person of your dreams becomes your worst nightmare. 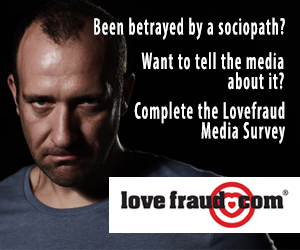 For more information, visit the Lovefraud.store. 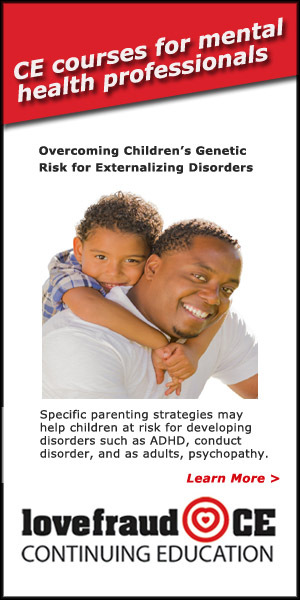 Thank you Liane – I did hope, with the Workbook, to add a real self-help dimension to this information. It’s important to know that sociopaths are out there, and the warning signs of their behavior. But it is equally important to identify the vulnerabilities in ourselves, so we can recognize – quickly – when someone is trying to take advantage of us. Not everyone will fall for a sociopath….why do some fall and some not? 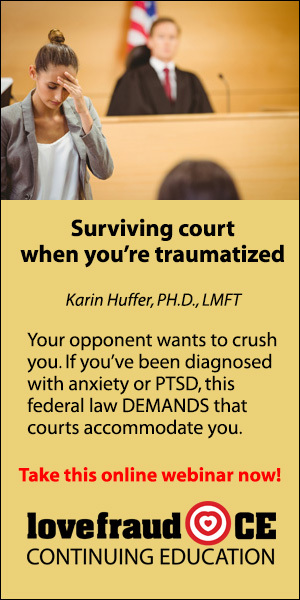 Why do some people become totally trauma bonded and others don’t? How can those of us who ARE vulnerable protect ourselves in the future? These are all things that we must learn in order to not be taken in again, and again and again. I do think that everyone should buy a copy of RED FLAGS for themselves and one to give to a friend….I think most of us have a friend who needs the information in those books. Liane, what a wonderful recommendation – I’ve found that Donna’s language SPEAKS to people across all spectrums. I love the term “Socially Sick”. I do think that everyone should buy a copy of RED FLAGS for themselves and one to give to a friend”.I think most of us have a friend who needs the information in those books. 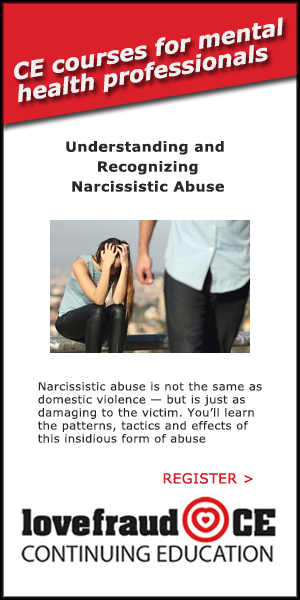 A suggestion to Donna – when I bought the book from Susan Elliot’s website she wanted to support victims of domestic violence – so if I wanted to assist her I could buy a book for myself and donate to send a second book to a domestic violence shelter. Many, many of the people who bought also sponsored books for domestic violence shelters. I am thinking I may try to a few extra sets with the workbook from Donna and donate to my local DV organization. Breckgirl – the idea of books for DV shelters is terrific! I already ordered and received the Red Flags book. How do I get the workbook to go with it? Is there a place to order it? Breckgirl – That is a great idea! I’m going to do the same. I should have read the article from the other day. I found out how to get my workbook. Thank you, Donna! Looking forward to using it. Forget Sociopath….Go Back to “Morally Insane”!!! Well, I had a Huge comment, But crap Happens. Female Spaths are worse than Male Spaths. They don’t go out for Collateral Damage. They go out for complete destruction! It’s been a week. How are things going? Is there much interest in your book (apart from your loyal fans here)? Any updates you can share?